Mr. Barry Dobner was recently prosecuted for having knocked down an 85 year-old woman while driving his battery powered mobility scooter. Mr. Dobner admitted to drink driving and ran down an elderly woman. The female collapsed to the floor with a cut to her leg and a bump on the head which required hospital treatment. Mr. Dobner was alleged to have driven away after the incident and returned to the scene some time later and spoke to police. Mr. Dobner was then breathalysed and gave a breath reading of 43 microgrammes (µg) of alcohol. This clearly puts Mr. Dobner over the legal limit which is 35 µg. 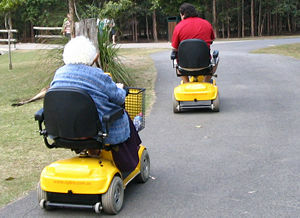 Motorists driving "mechanically propelled vehicles" on the road who are found to be driving whilst under the influence of alcohol are governed by a very different law to that of an electric mobility scooter driver. Senior partner of the firm, Jeanette Miller recently wrote a blog on confused.com's site about this very topic. Section 12 of the Licensing Act 1872 is relevant for incidents involving mobility scooters and bikes which states that it is an offence to be riding a cycle or to be in charge of any “carriage, horse or cattle” when drunk. Mr. Dobner may be surprised to find out that his mobility scooter would come under the title of ‘carriage’, rather than mechanically propelled vehicle. This archaic law requires the court to be satisfied that the driver was drunk. Merely suggesting that he was over the legal limit will not be enough to secure a conviction. There is also no lawful right for the police to request a breath, blood or urine sample to be provided in these circumstances. Despite this, Mr. Dobner was asked to give a breath reading which the police had no lawful right to request. Although the prosecution is in our view erroneous in law, Mr. Dobner appeared at South Sefton Magistrates and admitted drink driving. The judge banned him from driving for a year and he was also fined £150 with £85 costs. This decision was based on the fact that the judge has classed the mobility scooter as a ‘mechanically-propelled vehicle’ and that it is ‘unlawful to drink to excess and drive it on a public road or in a public place under Section 4 of the Road Traffic Act. The ancient Licensing Act would have been more appropriately applied in this case and would have given rise to a fine of up to £200 or one month in prison. We consider the Judge in this case to have erred in law as he had no power to ban Mr. Dobner from driving. Particularly as a mobility scooter driver does not need a driving licence to drive a scooter! As Mr. Dobner was involved in a collision with an elderly lady, it may be deemed too serious to be dealt with by way of fine. Therefore the judge could have relied on an offence under paragraph 35 of the Offences against the Person Act 1861. This could result in a maximum sentence of two years imprisonment if convicted. We suspect that had he had expert legal representation, Dobner's driving licence would have been saved. There clearly is a need for clarification of the position for mobility scooters, not just for scooter drivers but also for the judiciary!